Interaction Design concerns the interaction between people and products in which information technology is a central component. The interaction designer designs behaviors – of products, users and systems. Thus, interaction design is an essential part of any computer supported system or item; from social media sites, to games, to user interfaces in cars, computers or smart phones. It can be found in as diverse products as robots, GPSes, cameras, or systems for running nuclear plants or flight control. Overall, it is no longer enough to build a system, product or application that is only functional or efficient; there is an increasing demand for products that are not only efficient but also have other values, such as being pleasurable to handle and use or even fun or intriguing. As a consequence, interaction designers can and should be involved in all parts of the design process. Firstly, in pre-analysis: what is to be designed, for whom, when where, and how does this affect the design? What kind of user experience is the goal, which functionalities are needed? Secondly, in ideation, i.e. in coming up with the actual product and its behaviors. Thirdly (and most definitely!) in the actual interaction design, e.g. detailing exactly what the product or system does, and how it does it, e.g. how does it respond to user interaction. Thirdly, interaction designers may also take part in actually coding the system, enabling it to interact with users and collect various types of data. Lastly, in evaluation of systems and products, both after and during the design process. The subject is highly interdisciplinary, meaning that all interaction designers have different specialties, depending on background and skills, and as a result there is a whole set of interaction design-oriented jobs on the market; see “And the what?” below. 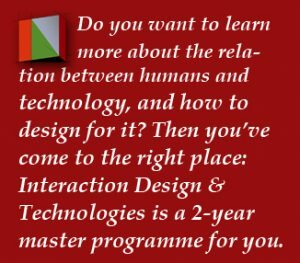 Interaction Design & Technologies is a two-year master at Chalmers University of Technology in Gothenburg, Sweden. The programme is intended for anyone with a keen interest in the interaction between humans and digital artifacts, and how to design it. This means that the programme attracts students from different educational backgrounds – e.g. psychology and cognitive science; computer science and information technology; and design disciplines such as industrial design, product design, media or architecture. All students must have some basic knowledge in Human-Computer Interaction and programming. Every year we admit ca 50 students, of which circa a third are international students. Does this sound like something for you? Read Chalmers’ own detailed description of the programme and find out the details on how and when to apply, entry requirements etc. The programme was started in 2001, meaning we have already educated some 700+ interaction designers. Some of our alumni work at IT-dense companies (e.g. Spotify, Microsoft, Google, Ericsson, Volvo, Telia, IKEA). Others work as consultants at for example Cybercom, Sogeti, Semcon, HiQ and UseIt. Yet others work in the game industry (e.g. at King, Square Enix, Palringo, Ghost Games, Zionk Games). Some even go into academia! They have positions like: Interaction Designer; UX Designer; Usability Expert; Software Developer; Game Producer; Solution Integrator; Senior Application Developer; Marketing and Communications Manager; Gameplay Engineer; Test Coordinator; UI & UX Engineer; Web Designer; Solutions Provider; Storyteller; Product Owner; Game Programmer; and Technical Evangelist.